The PMA-245+ is built with high-temperature components that enable years of trouble free performance. Some amplifiers are built with components that are rated at 85 degrees centigrade (185°F). Roemtech uses components rated at 105 degrees centigrade (221°F). In plenum areas, heat is the biggest enemy. That extra 36°F of protection can easily mean the difference between frequent service calls or years of trouble free performance. That's the Roemtech difference. 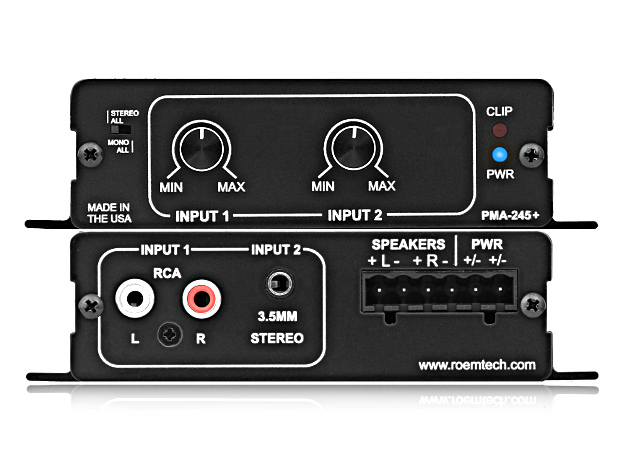 The PMA-245+ delivers a true 45 watts of power and will give even the largest classrooms the audio clarity needed. In many environments, ambient background noise such as HVAC systems and hallway traffic is an issue. With the PMA-245+, these issues won't overpower your sound system. The PMA-245+ has been designed with full-range performance in mind. Most amplifiers in this category do not put a lot of emphasis on accurate frequency performance. Roemtech has a different view, delivering crystal clear audio while maintaining impressive bass response. The PMA-245+ handles the entire audio spectrum with superb accuracy. Featuring the latest innovations in class D technology, you will experience stunning performance while staying on budget.